Published: Oct. 29, 2018 at 02:56 a.m. Updated: Oct. 29, 2018 at 12:26 p.m.
LOS ANGELES -- Jared Goff took off his helmet, put on a baseball cap and stared across the L.A. Coliseum field, feeling as helpless as a quarterback with a near-flawless game in the books and a two-point lead in the final minutes can feel. Standing on the opposite sideline was Aaron Rodgers, a quarterback he'd once idolized as a young Cal fan whose parents are proud alums, and one he later emulated as a Golden Bears star turned NFL standout -- a notorious dream-wrecker whose Green Bay Packers trailed Goff's Los Angeles Rams, 29-27, with 2:05 remaining in Sunday's game and were about to receive the ball. In other words, it stood to reason that the NFL's last remaining undefeated team was about to get served. "It was scary," Goff said later, as he celebrated with friends and family members outside the stadium in the Southern California twilight. "All our work on offense was done, and the ball was gonna be in his hands. I put on my hat and thought, It's his show now. It wasn't a very good feeling." And then, in a surreal sequence Goff and the Rams might regard as a pre-Halloween miracle -- and Rodgers and virtually everyone in the Packers' organization would likely depict in language not fit for print -- one Green Bay player made an executive decision that snuffed out Rodgers' Hollywood ending before it could begin, and left the Packers a bitter, frustrated bunch as they departed Tinseltown. As Greg Zuerlein's kickoff sailed into the end zone, Rodgers fully expected return man Ty Montgomery to kneel down for a touchback, given that the running back had been instructed by his coaches to do just that. Instead, Montgomery caught the ball 2 yards deep and raced up the middle of the field, crossing the 20 before being met by the Rams' Ramik Wilson. And then, a green-and-gold nightmare: Wilson's hard hit on Montgomery dislodged the football, which the L.A. linebacker would recover under a pile. The recovery provoked loud cheers from about half of the 75,822 fans and aghast groans from the other half (hey, the Packers travel well) -- and, according to witnesses, a very conspicuous display of anger from the quarterback who'd been denied the type of opportunity for which he lives. In the eyes of many of Rod gers' teammates, his ire was justifiable. 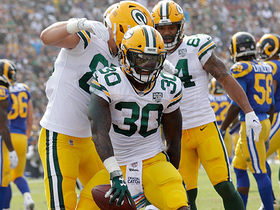 According to more than a half-dozen Packers players and coaches who witnessed it, Montgomery had thrown a tantrum of his own on Green Bay's previous offensive series, becoming noticeably enraged on the sideline after being removed from the game. At least one player believed there was carryover from that incident to Montgomery's decision to disregard his coaches' instruction and return the kickoff. Rodgers' trademark magic had bailed out the Packers (3-3-1) in their previous game, a 33-30 victory over the San Francisco 49ers on "Monday Night Football," just as it had in their season-opening, Sunday night triumph over the Chicago Bears, when the quarterback returned from what had appeared to be a serious knee injury to spark a sublime second-half comeback. Beating the Rams (8-0) would have been a different level of epic. Yet despite holding a 10-0 lead until the final three minutes of the first half, and despite a Rodgers-led comeback from a 10-point deficit that put Green Bay up 27-26 on his 40-yard touchdown pass to rookie receiver Marquez Valdes-Scantling with 8:50 left, this was a clear case of a team failing to capitalize on its opportunities -- a familiar story for those who believe the franchise has squandered a shot at multiple championships during the Rodgers era. As he exited the tunnel outside the Coliseum locker rooms and walked toward the team bus Sunday evening, Rodgers (18 for 30, 286 yards, one touchdown, no interceptions) didn't shy away from the notion that a lack of aggressiveness had come back to burn the Packers. 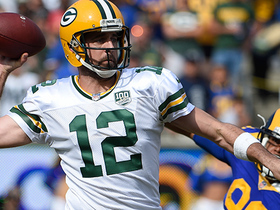 "Our defense was playing really well and stopping them over and over again," Rodgers said. "We've got to get more than 10 points while that's happening. And then to have it end the way it did, obviously, it's frustrating." The Rams' vaunted offense didn't get going until the final stages of the first half, when Goff (19 for 35, 295 yards, three touchdowns, no interceptions) connected with Josh Reynolds on a 1-yard touchdown pass to cut Green Bay's lead to 10-8. The play that turned things around for L.A. occurred with 2:54 left in the half, after Johnny Hekker's punt was downed by former Packers cornerback Sam Shie lds at the Green Bay 1. 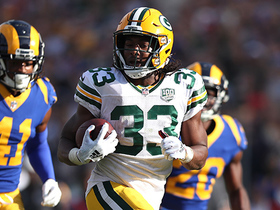 In a call that coach Mike McCarthy's critics will undoubtedly view in retrospect as symbolically stale, halfback Aaron Jones (12 carries, 86 yards, one touchdown) took a deep handoff and was met in the end zone by linebacker Mark Barron, who stuffed him for a safety. "That hurt us," another Packers player said. "This game was a bunch of little bulls--- that built up and caught up to us in the end. And (Montgomery's decision to return the kick) -- I don't even know what that was. I'm still in shock." A day earlier, as he prepared to face Rodgers for the first time, Goff wasn't quite in shock about the prospect of facing one of his childhood heroes -- but he definitely appreciated the magnitude of the moment. As a kid growing up in Novato, California, Goff frequently attended Cal games with his parents and fondly remembers Rodgers' run of success during the 2003 and '04 seasons, which included an NCAA-record-tying 23 consecutive completions during a narrow defeat to eventual national champion USC in the Coliseum 14 years earlier. Sitting in the lobby of the Rams' downtown hotel Saturday evening while watching a live stream of Cal's tense home matchup with Washington on an iPhone, Goff said he gained an even greater appreciation for Rodgers after entering the NFL as the top overall pick in the 2016 draft. "Early in my career, especially, we'd watch film of a defense we were getting ready to play, and when we'd see Aaron go against that defense, I'd see things that blew my mind," Goff said. "You're watching the defense, and your eyes start wandering to the offensive side. He does things so unconventionally that sometimes you have to rewind the tape and say, 'What was that? How did he do that?' "
Goff then enunciated his version of a sentiment that is more common in NFL circ les -- especially among players, coaches and talent evaluators -- that most outsiders might imagine. While Tom Brady is obviously one of the greatest quarterbacks of all time, and Drew Brees and Ben Roethlisberger are sure-fire future first-ballot Hall of Famers, Rodgers, among the cool kids, is frequently considered to be on another level. 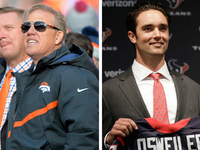 "Physically, I don't think it's even close -- he's the best ever," Goff said. "Just his arm talent, and what he does. I know Tom's incredible, and Joe Montana's amazing, but when it comes to straight physical ability -- and this is my 24-year-old, third-year-in-the-league perspective, so take it for what you will -- it's not even a contest. 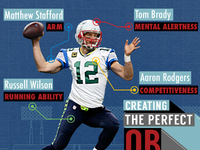 His hand control, his arm power, where he puts the ball ... it's freakish." 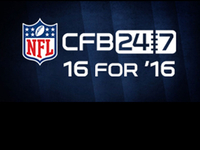 For the record, Goff's wunderkind head coach, Sean McVay, isn't about to argue. Shortly before leaving the stadium, McVay expressed his relief at ha ving been spared the prospect of a potential Rodgers two-minute drill, saying, "I mean -- Aaron Rodgers. He's made for that, and that's why he's one of the best of all time. Some of his throws today ... He's so good, it's a joke. He's not real life. The way that he's able to speed it up and make the ball come out of his hand, it's like a trick video. You feel like you're watching an optical illusion." Yet Rodgers' Sunday in L.A. can be summed up thusly: Clear eyes, full heart, did lose. And no, he was not amused. While walking to the bus Sunday, he did his best to fight through his frustration, bringing up Cal's 12-10 upset of the Huskies from the previous afternoon. "How 'bout those Bears?" said Rodgers, who is close with Cal head coach Justin Wilcox, an assistant on Jeff Tedford's staff during the quarterback's time in Berkeley. "He's the best. G reat win." A couple of hours before the game, Rodgers and Goff had chatted near midfield during their respective warm-up sessions, a conversation awash with blue-and-gold pride. 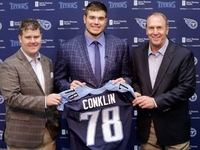 This was the first meeting between quarterbacks drafted in the first round who attended the same school since the New York Jets' Mark Sanchez defeated fellow USC alum Carson Palmer and the Cincinnati Bengals in 2010, and it did not disappoint -- at least, until Montgomery made his ill-advised decision to defy his coaches and take that ball out of the end zone. And, in a delicious twist for Cal alums, Montgomery happened to attend college at ... well, we'll let a Packers coach say it for us: "What do you expect from a Stanford guy?" joked the coach who, for the record, did not attend either rival Bay Area university. Rodgers was in no mood to joke about the fumble, but he did offer a note of optimism shortly before departing the stadium. The Packers, w ho travel to Foxborough to face Brady and the Patriots next Sunday night, are still in striking range of the Bears (4-3) and Vikings (4-3-1) as they enter the heart of their season, and their leader left the Coliseum convinced they can compete with anyone. "I'm not stressing," Rodgers insisted. "There's a lot of good that happened today. I feel better about our defense. The Rams are a good team; we knew they'd score some points. I said coming in, 'If we get to 30 (points), we win the game.' We got 27, and we gave 'em two. So there you go." And then Rodgers went back to Wisconsin -- still, like many of his teammates, stunned by the chain of events that deprived him of the chance to make magic, and determined to find a way to overcome it in the end.